Nowadays it seems difficult to comprehend why Faramondo (1738) was a marginally stronger success than its close contemporary flop Serse. Apostolo Zeno’s libretto concerns a conflict between the fifth-century Cimbri and Franks, and in a nutshell conveys Faramondo as the apogee of a moral hero who triumphs over his thorny adversities. The details of the plot are very complicated, so unwary listeners might be misled by the booklet’s sloppy printing of the English synopsis from Siroe. 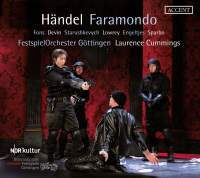 Laurence Cummings and his expert Göttingen Festival Orchestra produce a fine account of this undervalued opera, with varied orchestral subtleties and a sure mastery of Handelian style in this fully staged production recorded live last June. Accordingly, there’s stage noise, audience applause and all the minor flaws one encounters in a real theatrical performance, but the onstage noise does not obscure an elegantly rounded performance of Handel’s fine overture. Diego Fasolis’s all-star cast benefits from studio conditions (Virgin) but Cummings’s talented company truly inhabit their characters. The title-hero is sung masterfully by Emily Fons: the lovely cavatina ‘Sì, tornerò a morir’ has intimate sensitivity (matched by the pianissimo strings, sweet oboes and exemplary continuo realisation), and there is a thrilling synergy between her impactful singing and the orchestra’s momentum in the climactic ‘Voglio che sia l’indegno’. Anna Devin has steel and style in equal measure in Clotilde’s ‘Conoscerò, se brami’; her character’s seductive side is revealed in ‘Mi parto lieta sulla tua fede’, whereas her tempestuous ‘Combattuta da due venti’ brings the house down before Handel’s ritornello has chance to finish. Rosimonda’s indignant repulsion of Gernando’s unwelcome ardour is sung with entertaining sarcasm by Anna Starushkevych (‘Sì, l’intendesti, sì’). Christopher Lowrey sings Gernando’s spiteful ‘Voglio che mora, sì’ with dastardly glee, Njål Sparbo’s hot-headed tyrant Gustavo clearly has anger-management issues in the visceral ‘Sol la brama di vendetta’, and Maarten Engeltjes sings Adolfo’s ‘Se a’ piedi tuoi morrò’ in a sincerely heartfelt way that can only be created in a contextual performance (Philippe Jaroussky is merely pleasant in this aria for Fasolis). For the past 15 years Göttingen and NDR have developed a strong tradition of making stimulating live recordings of Handel operas but most of these were not distributed, so it is excellent progress that dedicated efforts like this are going to be widely available.